Fans gathered in Lawrence, Kan. Friday night as Kansas City blues rockers Brooklyn Rye played their first headline show at Jackpot Music Hall. The group has been playing together since July 2014 and, despite only playing a handful of shows, has a mature sound and seamlessly played a 12-song set. The group opened the night playing a three-song acoustic set at Five Bar and Tables next door to Jackpot. It was quite impressive for a band without an album finished. The group doesn’t have a packaged EP or LP finished at this point, and pulled off what many major label bands can’t – playing three songs with solid acoustic arrangements compared to their original electric versions. It was a great preview for what was in store later in the night. The group played original songs “Shoulda Coulda Woulda” and “Hangman” with “Hotel Yorba” by the White Stripes in between. The group masterfully converted their songs, which contain a lot of effects in their electric versions, and got the crowd involved – especially with the White Stripes cover. After the acoustic set, the members of Brooklyn Rye sat down with CMN for a brief interview. The group discussed getting together and discovering their sound, which they said is still a work in progress. “And four turned into ‘Demon Shake!’” vocalist Grace Griffin added with a laugh. “Demon Shake” is available on the group’s website here. The band, who seem really comfortable with each other and their individual skill sets, took time to explain where they get their sound – and take jabs at each other, jokingly of course. 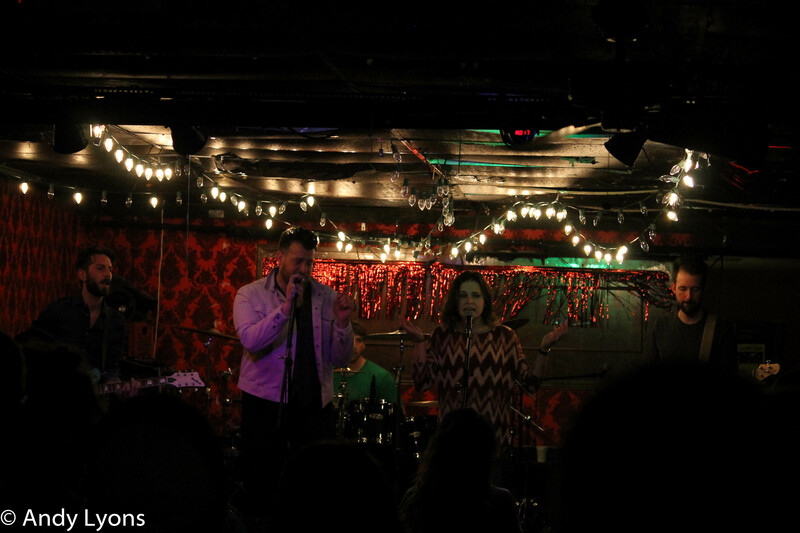 “We’re still figuring out our sound,” vocalist Steven Bauer said. “Not just sound, they do things differently to each other, too,” drummer Zach Dodson quipped. “I don’t think we know what our songs will sound like until (Dodson) gets done,” Moser finished. When asked where the band gets its bluesy sound, the members said contemporary bands are among their influences. But despite having specific bands in mind, they look at a broader spectrum for what they are going for. To hear the interview with Brooklyn Rye in its entirety, click here. Fellow Kansas City band Crystal Baller opened the show for Brooklyn Rye, and despite lead singer Ben Wendt’s biggest, weirdest attempts, he couldn’t get the 20 or so patrons to buy into the band’s sound. Crystal Baller were messy, at best. The keyboardist, bassist, and drummer seemed like they should be playing in a church band. They had a clean-cut wardrobe and a comatose play style compared to Wendt, who donned an American flag T-shirt with a giant bald eagle on it and a bomber jacket covered in patches. Wendt seemed to be the only person in the group excited to play, and he went ballistic. He was all over the stage, falling flat on his back while playing, screaming vocals and at one point went for a guitar throw, where a guitarist tosses his guitar and it spins around his body with the strap keeping it from flying, but his throw was stopped short by the low ceiling at Jackpot. As both guitar and vocals, Wendt just seemed to be trying to do too much, with the vocals and guitar work suffering because of it. Musically, Crystal Baller seemed like an odd combination of thrashy punk rock, a la the Ramones and ‘90s alt-rockers Blink 182. The group didn’t quite pull it off. By the time the first solid song was played, about six or so song into the set, most of the people in the crowd were already back to milling about and buying fresh beverages. After a lengthy sound check, with the sound tech at Jackpot to blame, Brooklyn Rye took the stage at about 10:45 p.m. and immediately wowed everyone in the building. The group had a great synergy and stage presence throughout their set. Throughout the show they each looked like they enjoyed themselves and had fun, which is something a lot of major label bands lack. Bauer and Griffin are spot on with the vocals, with Griffin masterfully singing harmony parts to Bauer, and taking the lead on songs such as “Doghouse Blues,” which was probably the band’s best song of the night with Bauer donning a harmonica. The group showed their playful side during “DSTFML,” which stands for “Don’t Stop the Flow, My Love.” Toward the end of the song, the band transitioned to a playful version of “What’s Up” by early ‘90s group 4 Non Blondes, which also became viral when the song was dubbed over the ‘80s He-Man cartoon. Bauer held the microphone in front of Babson as the crowd cheered the group on once they realized the song. There were extended versions and jam sessions throughout the show, with the group adding “Jam Break” to the setlist between “Hangman” and “Doghouse Blues.” The group pulls off each song with masterful rhythms and melodies. They have a bluesy sound that gives homage to Blues greats such as Muddy Waters and B.B. King, but fresh enough to hang with contemporaries such as the Black Keys or Jack White. The band’s one shortfall is some of Bauer’s vocals. While some of his falsetto and grittier delivery may be a bit offputting for some listeners because of its contrast to the bluesy sound, it still works with the band’s sound. As the group continues to play and grow together, it will be interesting to see how they develop and use Bauer’s range as they continue creating. Bauer said the group has “safely right now 12 (songs) with at least six to eight on the way.” They have plans to continue playing throughout the summer, with a headlining show at Davey’s Uptown June 6 and then June 13 for Kansas City Invades the Capitol in Topeka, Kan. Follow Brooklyn Rye on Facebook here. Check out their SoundCloud here.